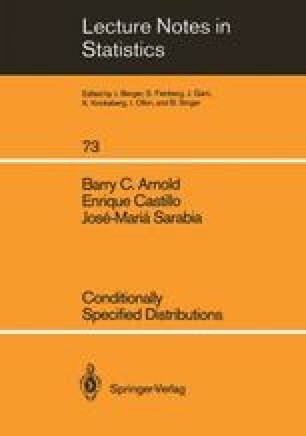 By now, we have developed a repertoire of experience in characterizing distributions whose conditionals are required to belong to specified parametric families. Two kinds of surprising results have been encountered. On the one hand, the class of conditionally specified joint densities might be surprisingly constrained. For example, exponential conditionals models turn out to be always negatively correlated. In some sense, then, specifying the form of the conditional distributions is more restrictive than we might have envisioned. On the other hand, the conditionally specified families often include unexpected models with anomalous properties; for example the non-classical normal conditionals models with their unusual biquadratic regression functions. Many of the conditionally specified models have high dimensional parameter spaces. Interesting subfamilies are frequently obtainable by invoking additional conditions on the form of the regression functions or other conditional moments.